This guide originally was created for Washington and Lee University's 2013 Constitution Day observance. It is intended to help informed students identify and use some of the most important resources associated with study of the U.S. Constitution. Respected overview of the subject area and a list of recommended books. Which writings likely influenced the authors of the Constitution? What did these Founders write? 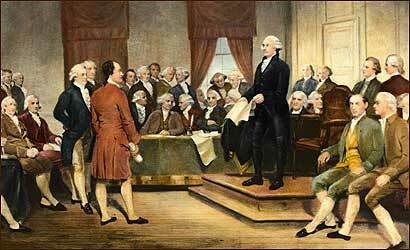 The 1787 Constitutional Convention spawned much discussion and resulted in document amended and critiqued for over 200 years. Select organizations and Web sites providing ongoing education about the Constitution. Washington and Lee students who wish to delve more deeply into research on Constitutional issues are invited to make use of the research guide for Professor Bill Connelly's James Madison seminar, particularly the "Find Books" and "Find Articles" pages.